Few years ago, while studying alternative therapies, I came across a very interesting chapter in naturopathy -“Miracles of Alkalizing Diet”. This chapter appealed to me because I could relate to it very well. It seemed to have solution to some of the health issues at home. In spite of being diet conscious, eating moderately and timely, some members had indigestion, nausea and burning sensation in pharynx. This could be traced to acid –alkali imbalance. A change in the diet helped to great extent. The acid –alkaline balance plays a vital role in balance body chemistry which is important in maintenance of health and healing of diseases. Normal body chemistry is approx 20 % acid and 80% alkaline. Whenever the alkalinity of the blood is reduced, its ability to transport carbon di-oxide is reduced. This causes acidosis or hypo-alkalinity of the blood. Its symptoms are hunger, indigestion, nausea, vomiting, headache, drowsiness and burning sensation in pharynx. Acidosis is the breeding ground for most diseases. It also lowers the vitality of the system, thereby increasing the danger of infectious diseases. Our daily diet should consist of four-fifths of alkaline forming foods such as fruits (except plums and prunes that are acidic), tubers, legumes, leafy and root vegetables and one fifth of acid forming foods. Cereals of all kinds, nuts (except almonds), meats and eggs are acid forming foods. Eating sensibly in this manner will ensure the necessary alkalinity of the blood, which will ensure good health. Our good food habits and practices tend to get slow paced or forgotten over a period of time. Few days back, a very dear friend of mine raked this topic on a social networking site. This prodded us to get back to track. A whole lot of seasonal fruits including bananas were bought. The bananas started turning over ripe. Some were salvaged in Marbled Banana Bread. Heat oven to 180 degrees C. Grease and line a 9 x 5” baking tin. Take chocolate chips in a steel bowl. Boil some water in a wok; carefully place the bowl in the center. The chocolate will start melting. Remove the bowl when the chocolate melts completely. Take butter and sugar in a bowl. Beat till fluffy and creamy. Add eggs, one at a time, mix well, add mashed bananas. Add yogurt and mix till the batter becomes uniform and creamy. Whisk both the flours, baking soda, salt and cinnamon. Add flour mix to wet ingredients and stir till well combined. Do not over mix. Take one cup of this batter in the bowl containing melted chocolate and mix evenly. Pour a little of the plain batter and same quantity of chocolate batter alternately in the baking tin till the batters are over. With the back of a spoon, make a couple of swirls. Bake for 55 to 60 minutes or till a toothpick come out clean. Remove from the baking tin after 5 minutes. Cool in the rack. Hello Namita, so agree on the healthy diet approach. Most of our illness is to a large extent related to our eating habits and if planned well, diet can contributely greatly to a healthy us. 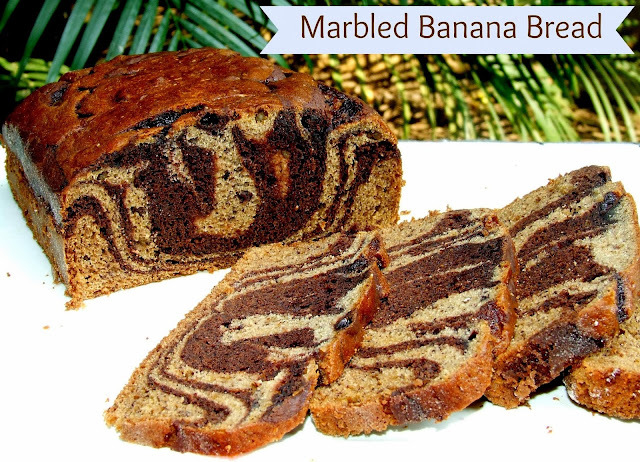 Loved these marble cake. I am guilty of discarding a few extremely over ripe bananas just a few days back. Next time will transform them into one of these goodies! If you are going to indulge in acid forming food this cake is the way to go ;). What a pretty cake. I alwaysd seem to have ripe bananas about and am always looking for inspiration. 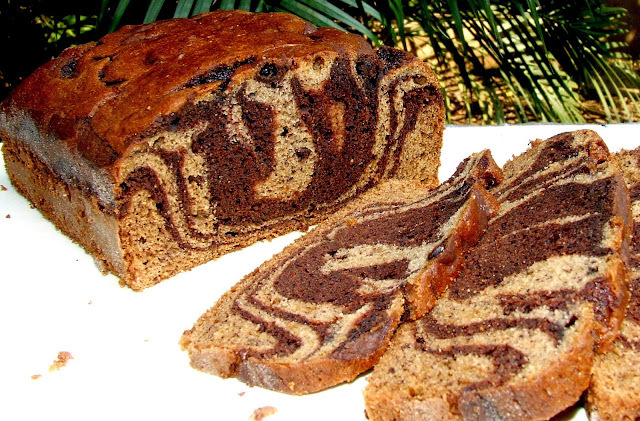 I've made a banana and chocolate cake int eh past and called it Tiger cake. Such and interesting concept, and makes a lot of sense. The cake looks YUM! !